Have you ever had one of those moments where everything lined up just perfectly, and you had nothing to do with it? For the past few years, I’ve gone through a long period of growth that, looking back, I can clearly see the winding path that led to a very key moment in November of 2017. (More on that in the video and below.) Long story short, I found myself digging into creative wellness after realizing that I’d put up walls against my vulnerability, because…pain, burn out, and other not-so-nice words. I knew I’d benefit most from getting together with other creatives who experienced the world and their own creativity in ways that were similar to mine. There’s a healing power in coming together with a group…especially a group that gets you. Turns out, that group didn’t exist…until now. Because last November, out of the blue, I got an email from creativity coach Kerry Schafer about this exact thing, and we started talking about how to help other creatives deepen their understanding of their own creativity so that they could begin to heal from burn out or building walls or a long history of defeats or simply learn tools to be more productive with their chosen mode of creativity. Kerry calls this synchronicity, and I love that idea, don’t you? Being in sync with someone else, allowing an idea to play out and use you to an extent, so that you can be of help to others. Turns out, it wasn’t just timing that Kerry and I were synced up in, and it wasn’t just this similar idea with both had. Nope. Our synchronicity went deep. Eerily deep. About four years ago, I reached a moment when I was stuck in traffic on my way to a job that really didn’t fit who I am and said aloud, “This is going to kill me. I cannot keep doing this.” I had a wonderful boss, a fantastic group of people to work with, and honestly, nothing that I could really complain about the job or company other than the position was a horrible fit for my personality. And it was sucking me dry. I felt like a husk by the end of each day, with nothing left to give, not to my family, certainly not to my writing. I began to have some chronic health issues, which my doctor related all to my stress. Kerry’s story is similar, which you can listen to in the video. I’ll let her tell you her story in her own words. Going back to that moment, sitting in traffic, saying aloud, finally, loudly, with a lot of tears, that the life I was living was not sustainable, things started clicking. It was if the universe needed to hear me admit it out loud to start shoving things into place. From that moment on, I became focused on crafting the life I wanted. I soon came to realize that crafting the life I wanted wasn’t enough. I needed to craft the life I needed. I became active in my pursuit of figuring out what fit best in my life. 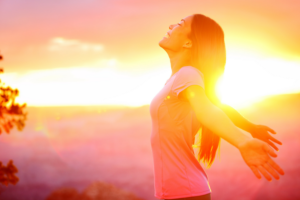 What gave me energy and made me feel fulfilled? What allowed me to be the mom and wife that I wanted and needed to be? What directly fed my writing? In short, what was the connecting point of my passion and my purpose? Crafting a life that you need is more than just finding a new job or making a couple of changes. It’s a shift in perspective. It’s the process of understanding that you are worthy of a good life. And it starts with learning how to say no to the things that no longer feed you, and yes to the things that do, no matter the fear that sneaks in. Because there will be fear when you stand on the edge of something new, of change, and it will feel like there is nothing supporting your toes. But you have to take that leap. Because without doing so, you’ll never be living the life you were made for. And your creative health…and potentially your physical and mental health…will plummet. Creative wellness isn’t some woo-woo term. Creative wellness is the act of mindfully (read: purposefully, actively) pursuing a balance of mind, body, spirit, and creativity. We are not one-dimensional beings. We are multi-dimensional, and there is a scientifically-proven direct link between our creative health and our physical health. On the whole, creatives who are living their life purposefully tend to lead longer, healthier lives. Are you investing in your creativity? How? Or is your creativity the last thing on your list? What percentage of your work energizes you? And finally, have you found balance? I have to admit, the video and this article just teared me up completely. I can’t begin to tell you how much stress, anxiety and sense of overwhelming chaos looms over my head too often. (More as of late). It’s only when I’m being creative that I find a sense of peace and relief. Sadly, not many people understand this and feel as though creativity is a luxury. I think that is completely false. It’s 100% a necessity and I applaud you and Kerry for creating this amazing wellness retreat concept. If I had money and didn’t have a 2 year old toddler who demands every second of my day, I would hop on a plane and be a part of that retreat in a heartbeat! I am just starting out on my adventure to help promote creativity as well. I truly believe that you guys following me on Twitter was fate because I have been searching for others with as much passion as I have for creativity. I was starting to think I was absolutely crazy for having so much passion about something that a lot of people don’t seem to be very interested in. I just started out my blog and I am trying to build a creative community on my blog site (which isn’t going too well yet). Hearing your stories in the video has completely inspired me and helped me realize I’m still missing so much and that this is merely just the beginning for me. I am now researching how to become a creativity coach! About 3 years ago, I attempted to go back to school to try and become a teacher. Unfortunately, various circumstances popped up and let’s just say I wasn’t able to even complete a semester. And now, I simply don’t have the time to go back to school and spend 4 years getting a degree. Now I have a 2 year old baby boy, I’m unemployed, and I’ve become obsessed with creating my new Creative Community and blog as a therapeutic outlet for everything going on right now and of course, a way to try and make some income. As soon as I heard the words “Creativity Coach” my eyes literally popped open, my heart jumped and the butterflies in my stomach started tingling! Not only will this take me back to my goal and desire for teaching, it also focuses around my biggest passion! Creativity! Thank you SO much for inspiring me! Ok, enough of my novel writing over here! I’m sure you two are beyond busy. But in all seriousness, I truly would love to collaborate with you guys to help promote creativity! Have a fantastic night Ladies! I’m so glad you found us! I think you can tell from the video that both Kerry and I have been in THAT place, and it’s not a fun place to be. I’m thrilled that you are putting such a huge importance on your creativity. I strongly believe that having a creative outlet for creative personalities is NECESSARY. When we are not exploring our creativity, we’re like a car without an exhaust pipe. We HAVE to have that creative release otherwise our body physically reacts to all that pent up creativity. I experience mild depression and overall crankiness when I don’t make time for my creativity. It is absolutely essential! We are happy to cross-promote your blog! I’m so so glad you reached out!